Because of the general interest in North Korea that has been building for some time, I'll keep updating y'all on details. The mouse that roared is continuing to roar. It's what they do. North Korea detained a Korean-American professor at Sunan international airport outside Pyongyang just before he was boarding an aircraft for China. The professor had just completed a month-long course at Pyongyang University of Science and Technology. In my humble opinion, ANYONE who travels to North Korea essentially signs their own death warrant. If they come back out, they dodged a bullet. I don't think that the US should take extraordinary means to rescue/save them beyond the general humanitarian efforts that we always make to ease the suffering of US prisoners held by savage and uncivilized nations. North Korea has not announced the arrest. The Swedish Embassy in Pyongyang, which performs consular functions for the US, informed the press, but provided no information about the reason for the arrest. Kidnapping is a tactic that the North Koreans sometimes use to invite talks with the US without appearing to be weak. However, President Trump is not his predecessors. 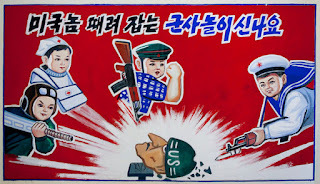 Kidnapping may be something that the Norks like to use, but that is unlikely to bring the US to any sort of bargaining table during this administration. North Korea has resumed activity at the Punggye-ri nuclear test site. Volleyball time has ended. The workers have placed more camouflage materials over trailers and equipment. The imagery analysts at 38 North published an update of the status of the site based on the latest imagery. On 19 April, the site was judged to be in standby status. That has ended, though a volleyball court outline is still visible. The judgment still stands that the North Koreans can detonate a nuclear device at any time. North Korea issued more threats against the US and against the aircraft carrier USS Carl Vinson. One threatened a "super mighty attack". The threats against the US are worth relating. The North Koreans have submarines that can be deployed against the carrier battle group. The carrier battle group also includes attack submarines that specialize in sinking enemy submarines. The North Koreans heavily rely on US press releases for locating US aircraft carriers beyond the Sea of Japan. They can be deceived and regularly miss US deployments that are made without accompanying press releases. 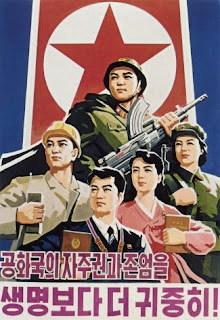 The anniversary of the Korean People’s Army (KPA) is 25 April. It is another occasion for a show of capabilities. On 21 April, news services reported alerts and force movements by China and Russia towards the North Korean border. Some units of the Chinese air force reportedly were placed on high alert. Specifically mentioned were Chinese bombers equipped with air launched cruise missiles. They reportedly conducted a major exercise in northeast China. China denied the aircraft alert. Reports on Russian movements said that ground force units were moving to the North Korean border. The Russian government denied that it was reinforcing the border, but did not deny that troops moved into the border area. It said the troops were returning to base from deployments in other regions. The Russian border with North Korea is 17 kms long, just northeast of Sonbong. It is not an area where major Russian troop units can be concentrated. Vladivostok, however, is a major Russian port and military town. It is 170 miles northeast of the North Korean border. This was an unusual convergence of reporting for nothing to be happening. Something North Korea did or was about to do seems to have got the attention of the Chinese and the Russians.